We had a very enjoyable weekend with the highlight being able to catch up with Michael and William Frost (from Field Blend, Tasmania) and their webmaster Matt. After an early lunch at The Branch in Nuriootpa discussing numerous things including wine, cars, travel and all the other banter that goes hand in hand when you are enjoying the company of good people, our Tasmanian friends headed back to Adelaide and James, Mark and I took a leisurely drive around the Barossa before landing under Mark's pergola with bottles of shiraz, riesling and semillon in hand. 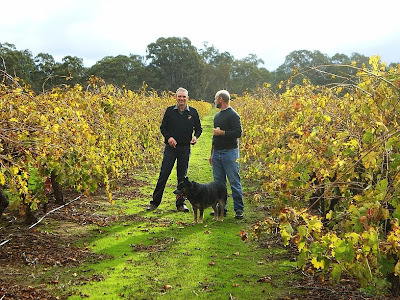 The Barossa was at its autumn best - a slight chill in the air but still enough sunshine to stop you from being too cold. The birds sang happily while we took an afternoon stroll through the lovely vineyards of Gumpara Wines. Mark's dog Blake enjoyed the walk but proved to be the hardest photographic target of the day while I was taking photos for Mark's wine blog. We returned to the pergola feeling inspired, happy and ready for another glass of warming shiraz. A terrific end to a wonderful afternoon. Days like this make you realise how lucky you are to be in an industry where no matter who you are or where you are from, you are bonded by your passion for wine, be it drinking it or making it. And what better place to be right in the thick of it than the Barossa!